Today I found out Rudolph the Red-Nosed Reindeer was created by the department store chain Montgomery Ward as a way to save money on one of their annual Christmas promotions. The year was 1939; Montgomery Ward, at that time, gave away coloring books to try to get more shoppers into their stores during the holiday season. Up to this point, they simply bought these coloring books to give away. In 1939, in order to save on the price of the books, they decided to try to make their own. Enter Robert L. May who was a copywriter for Montgomery Ward in Chicago and was apparently known by his peers to be good at writing limericks and children’s stories. Because of this, he was chosen to write a Christmas story to be used for this promotional coloring book. May’s boss did not like it at first, due to the fact that he felt a red nose implied the reindeer had been drinking. However, once it was partially illustrated by Denver Gillen, who worked in Montgomery Ward’s art department and was a friend of Mays, his boss decided to approve the story. In the first year after its creation, around 2.4 million copies of Rudolph the Red-Nosed Reindeer were given away. By 1946, over six million copies of the story had been distributed by Montgomery Ward, which was particularly impressive considering it wasn’t printed through most of WWII. After the war, demand for the story skyrocketed, receiving its biggest boost when May’s brother in law, radio producer Johnny Marks, created a modified musical version of the story. The first version of this song was sung by Harry Brannon in 1948, but was made nationally popular by Gene Autry’s 1949 version, selling 2.5 million copies of that version in 1949 alone and has sold to date around 25 million copies. 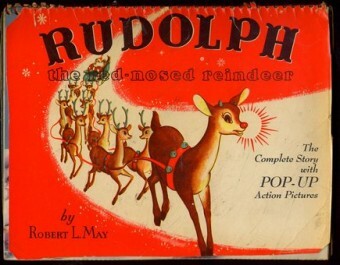 Interestingly, despite the fact that May created the story of Rudolph and it was wildly popular, he did not at first receive any royalties from it because he had created it as an assignment for Montgomery Ward; thus, they held the copyright, not him. In a rare move for a business, in 1947, Montgomery Ward decided to give the copyright to May with no strings attached. At the time, May was deeply in debt due to medical bills from his wife’s terminal illness. Once the copyright was his, May quickly was able to pay off his debts and within a few years was able to quit working at Montgomery Ward, though just under a decade later he did go back and work for them again until retiring in 1971. It was Johnny Mark’s song version of Rudolph the Red-Nosed Reindeer that ended up being the version that has been adapted to TV and is popularly known today. The TV special has since become the longest running Christmas special in history, having been telecast every year since 1964. Rudolph did not live at the North Pole nor was he descended from one of Santa’s reindeer, but was a regular reindeer living elsewhere in the world. Despite being Jewish, Johnny Marks wrote many other Christmas songs, a few of which, like Rudolph the Red-Nosed Reindeer, have popularly survived today. These include: Rockin’ Around the Christmas Tree; A Holly Jolly Christmas; and Run Rudolph Run, among others. Gene Autry’s 1949 version of Rudolph the Red-Nosed Reindeer is the only song in history to hit #1 in the United States and then one week later not appear anywhere on the charts (after Christmas). Before settling on “Rudolph”, May considered naming the red-nosed reindeer Rollo and Reginald, but thought the former was too jovial sounding and the latter sounded too British. The voice actors who played Rudolph and Hermey in the stop motion CBS classic version of Rudolph the Red-Nosed Reindeer now both live in the same retirement community in Ontario. In that original TV version, Rudolph, Hermey, and Yukon Cornelius promise to help the toys on the Island of Misfit Toys. However, in that original version, once Rudolph and company leave the island, they never actually bother to help the toys. This resulted in numerous complaints that Rudolph broke his promise, so a new scene was added to the end where Rudolph leads Santa to the island to collect the toys. In Finland’s Santa tradition, they also now include a Rudolph character leading Santa’s sled. However, interestingly, in Finnish tradition, these reindeer do not fly. I seem to recall that the woman who voiced Rudolph in the Christmas special actually passed away this year. According to lore, Rudolph the Red Nosed Reindeer was the “B” side of Autry’s record. His wife predicted it would sell well because of Rudolph, and not the publicized song on the “A” side of the the 45 rpm record.